All orders $99 or more that are being shipped to the continental United States (excludes Alaska, Guam, Hawaii and Puerto Rico) qualify for free standard shipping. Please select this option during checkout. 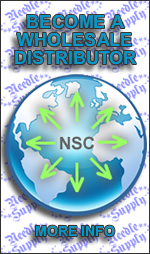 *Distributor accounts do not qualify. If the items in your cart total $99 or more, your order ships FREE! The free shipping is standard shipping (2-7 business days). If you need your order sooner, you have the option to pay for express shipping. We work hard to process orders as fast as we can. Most standard orders will be shipped within 2 business days. In extremely busy times, it may take up to 3 business days. Saturday and Sunday are not business days, orders are not processed on these days. All express orders received Monday-Friday before 3pm Arizona Time will be processed same-day. All express orders received Friday after 3pm or Saturday or Sunday will be processed on the following Monday. All packages are shipped from our Arizona warehouse via UPS, FedEx or USPS. 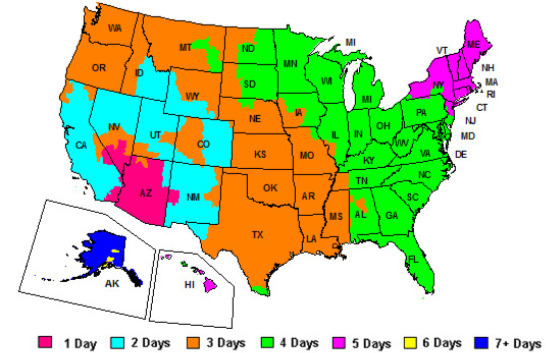 If you choose expedited shipping such as Next Day Air, 2nd Day Air or 3 Day Air, your package will arrive accordingly. If you choose U.S. Mail, UPS Ground, UPS Standard or Standard Free Shipping, your package will arrive within 2-7 business days. Please see the transit map below to estimate the transit time from Arizona. *Note: Transit times posted and illustrated are estimates only. Your package may arrive sooner or later than estimated times unless expedited shipping was selected. All packages are shipped from our United States warehouse via UPS, FedEx or USPS. Typical transit times are 3-8 business days for most countries. Some delays may occur due to customs clearance and inspection.